Thank you note samples are used by job seekers as a guide to writing successful interview thank you notes. A job interview thank you note shows employers you are considerate and that you pay attention to detail. 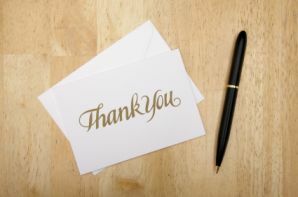 A post interview thank you note should be sent to every person you interviewed with or helped you in the job interview process. This includes managers, recruiters, customer service representatives, administrative assistance, receptionists, everybody! Always try to get a business card from all people involved if they have one. That way you can shape the style of your job interview thank you notes to fit that person. Getting a business card also ensures you spell their name correctly! An interview thank you note is essential to the job hunting process. Unfortunately, most people who interview for employment do not write or send a thank you note after an interview. However, those that do give themselves an edge over other job candidates. Thank you notes for job interviews should be writing and sent ASAP or the day of the interview. This will make the best impression with the interviewer. Do not send the same job interview thank you notes to all people who interviewed or assisted you. Remember, you want the thank you note to be styled to the individual and the company. …will contain the following things. Address the thank you note to individuals by title and name. Keep the job interview thank you note short. Use the thank you note to reinforce your skills and qualifications. Briefly include relevant to the job info not discussed in the interview. Use second “person” more than “first” person tense. Speak about “you” instead of “me” or “I”. Always use postal mail and email when appropriate. 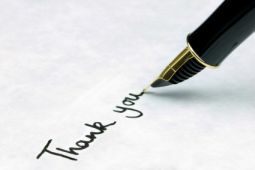 A handwritten thank you for job interview note or card has greater effect. But type it if your quality of handwriting is not that great. Mention that you will follow up with the interviewer in about a week. Always end interview thank you notes with a Thank You. Employers don’t have the same expectations when it comes to interview thank you notes. Some companies attach no special significance to it. However, others view it as an essential part of the job interview process. You should nonetheless focus on writing thank you notes to set yourself apart from other job seekers. Make sure the tone of the interview thank you note is positive, upbeat and confident. Reinforce the fact that you would be an asset to the employer. Personalize the thank you appropriately but make sure it stays professional. Express interest in another potential opportunity even if you are not selected for the current position. This is where you show your appreciation and thank the person you interviewed with. Thank him/her for the meeting and the tour of the company if any. Also, mention the position applied for. You may want to make a favorable comment about the company. Restate your interest in the business and the job. Talk about how your qualifications are a good fit for the position. Mention any related experience not talked about in the interview. Focus your comments on the needs of the interviewer concerning the job. Respectfully mention to the interviewer that you will be looking forward to a call from him/her. Indicate that you are available for a second interview to clarify or add new information about your qualifications and skills for the position. Tell the interviewer you will contact them in a week or so for the status of the position. Always end by thanking the job interviewer(s) again for his/her time and attention. The following are thank you note samples. They are intended to help you structure your own creative job interview thank notes. Again, always keep the interview thank you notes short, sweet and to the point. Let's look at some thank you note samples. Many thanks for the opportunity to meet with you yesterday about the Financial Management position. ABC Corporation appears to have everything I need to develop my skills and qualifications. I have worked with the EDY financial system software your company uses the past two years. That experience will be a great asset to your business. I expect to get a call from shortly. Please feel free to contact me for additional information. Again, thank you for your consideration. I enjoyed interviewing with you this morning at EFT Corporation for the A+ PC Technician position. The job requirements you shared line up perfectly with my education, training and experience. I have utilized my A+ certification with great skill in maintaining a 200+ PC network at ABC, Inc. I can step into this position with a minimal learning curve. I will call you next Monday for the status of the position. I look forward to speaking with you soon. Thanks again for your consideration. An after interview thank you can be in the form of a note or letter. Interview thank you notes and letters are essentially the same. Job interview thank you notes tend to be shorter than interview thank you letters. Both can be formal, informal, handwritten or typed. I personally prefer handwriting thank you messages. Handwritten thank you notes and letters show the employer you a serious about the company and the job. There is more to learn about how to write a job interview thank you note by following this link to my interview thank you notes page. The easiest way to find what you are looking for, is to simply enter your search term into the Google search box below.